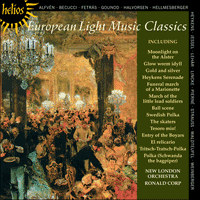 One of Ronald Corp and the New London Orchestra’s most beloved albums: fifteen gems of the light music repertoire from across Europe, with music by Alfvén, Fetrás, Halvorsen, Heykens, Hellmesberger, Jessel, Lehár, Lincke, Pierné, Waldteufel, Weinberger and others. As with the British programmes, the composers’ names may not be familiar but much of the music will be, especially to older listeners—‘Ah, so that’s what that’s called!’ they’ll say. The Gounod Funeral march, for example, will be familiar as the signature tune of Alfred Hitchcock. As the cradle of classical music, the continent of Europe has always produced a fund of melodic pieces that have penetrated deep into the consciousness of people around the world. Some are the productions of composers celebrated more for larger-scale forms, while others originate from composers of more modest pretensions for whom a single world-wide success may rank as their sole remaining claim to fame. Inevitably Vienna, for so long the musical centre of Europe, plays a prominent part in any representative selection. Indeed no collection of popular European music would be complete without something by the Strauss family of dance composers. Eldest of the three sons of the dynasty’s founder Johann I, the younger Johann Strauss (1825–1899) directed his own orchestra for a quarter of a century before retiring to concentrate on the composition of operettas. His Tritsch-Tratsch-Polka (‘Chit-Chat Polka’) dates from 1858 and is the earliest piece in this collection. It takes its name from a weekly Viennese satirical journal, and the chattering melodic line admirably conveys the impression of local people exchanging the latest gossip. Joseph Hellmesberger (1828–1893) was a member of another celebrated Viennese family. His father Georg was the most popular Austrian violinist of his day and the first leader of the Vienna Philharmonic Orchestra. Joseph followed a similar path, founding the Hellmesberger Quartet and holding various eminent positions. He in turn had a son, Joseph junior, who became conductor of the Vienna Philharmonic Orchestra and a composer of ballets and operettas. The elder Joseph’s compositions were mostly for the violin or strings, as with Ball-Szene (‘Ball scene’). It is based on a violin study by the violinist Joseph Mayseder (1789–1863) and is scored for strings, harps (with optional woodwind), timpani and triangle. Its whirling main theme makes virtuoso demands on the violins and frames a more relaxed central section. Elsewhere in the Austro-Hungarian Empire, the opulently scored folk-opera Švanda dudák (‘Schwanda the bagpiper’, 1927) by the Czech composer Jaromír Weinberger (1896–1967) earned the widest popular success of any Czech opera after Smetana’s The bartered bride. As with Smetana’s opera, that success was extended by the huge popularity of the folk dances extracted from the opera. Most particularly in the case of Weinberger’s opera, it was the Polka which Schwanda plays on his bagpipes at his entrance in the second scene of Act 1. All three German composers represented in the programme were specialist light music composers. ‘Oscar Fetrás’ was the pen-name of the Hamburg conductor Otto Faster (1854–1931), who was such an ardent fan of the ‘Waltz King’ Johann Strauss that he not only composed in similar style but also built up an important collection of Strauss memorabilia and even modelled his appearance on his idol. This indebtedness is well displayed in his most successful waltz, Mondnacht auf der Alster (‘Moonlight on the Alster’), which dates from around 1890. Just as Strauss’s most celebrated waltz takes its name from Vienna’s principal waterway, the Danube, so too is Fetrás’s named after Hamburg’s—the tributary of the Elbe that at Hamburg forms two lakes, the Inner and Outer Alster. Paul Lincke (1866–1946) was one of Germany’s finest melodists and the composer of many short pieces indelibly associated with the city of Berlin. He played and conducted in dance orchestras and theatres and was for two seasons musical director at the Folies-Bergère in Paris before establishing himself as conductor at Berlin’s Apollo Theatre. In 1899 he composed the first of a series of short operettas for the Apollo, which concentrated less on dramatic integration than on spectacle and individual display pieces. It was for one of these, Lysistrata (1902), a burlesque of the Aristophanes story, that Lincke produced the haunting Glühwürmchen-Idyll (‘Glow worm idyll’). For concert performance he added to the operetta’s song a contrasted central section, in which form the piece became a celebrated vehicle for the ballerina Anna Pavlova. Leon Jessel (1871–1942) was born in Stettin in eastern Germany (now Szczecin in Poland) and became a theatre conductor and composer of operettas and short orchestral pieces. The latter included two that achieved international renown—Der Rose Hochzeitszug (‘The wedding procession of the rose’) and, above all, his Parade der Zinnsoldaten (‘Parade of the tin soldiers’). This admirably portrays its subject and was for many years after World War II familiar to children in Britain as the signature tune of the ‘Toytown’ series on BBC Radio’s ‘Children’s Hour’. Jonny Heykens (1884–1945) was another light music specialist, born in the Dutch town of Groningen. A violin pupil of Eugène Ysaÿe at the Brussels Conservatory, he played in various orchestras before founding his own orchestra in Groningen in 1914. Among his many light music compositions, it was above all his Ständchen (‘Serenade’) which won wide international success between the Wars. Moving into Scandinavia, we find in Johan Halvorsen (1864–1935) a distinguished Norwegian violinist, conductor and composer. His output included three symphonies and numerous Norwegian Dances and Rhapsodies, but he is best known for his Bojarenes inntogsmarsj (‘The entry of the Boyars’), published in 1895. The Boyars were members of the old Russian aristocracy, about whom Halvorsen read after being offered a position in Romania. He turned the job down, but was inspired to compose this brilliantly scored piece in which we hear the Boyars first approaching and then marching past. Hugo Alfvén (1872–1960) was a Swedish composer whose output included five symphonies and much vocal and instrumental music. He composed several pieces that achieved popular international success, including the first of his three Swedish Rhapsodies. Another was the piece recorded here, which was originally entitled Roslagvår (‘Spring in Roslag’) or Roslagspolketta (‘Roslag Polka’) and gained international currency during the 1950s under the more approachable title Swedish Polka. France’s rich musical tradition must inevitably feature in a programme such as this. Charles Gounod (1818–1893) can justifiably be regarded as the central figure in French music of the third quarter of the nineteenth century. His compositions included symphonies, songs and religious works, though he is best known for operas such as Faust. The charming Marche funèbre d’une marionnette (‘Funeral march of a marionette’) was first published as a piano piece in 1872, and its popularity was such that Gounod provided an orchestral version six years later. Émile Waldteufel (1837–1915) owes his German surname to his Strasbourg origins, but he lived virtually his whole life in Paris, where he became conductor of the balls of the Second Empire and Third Republic. He was the most widely successful waltz composer after Johann Strauss, his masterpiece being Les patineurs (‘The skaters’, 1882). In it one readily detects the skaters testing the ice, gliding around, and trying some daring leaps. Sleigh-bells enhance the wintry scene. Gabriel Pierné (1863–1937) was likewise born in eastern France (in Metz) and moved to Paris as a boy. A pupil of Massenet and César Franck, he succeeded the latter as organist at the church of Ste-Clotilde in Paris. He composed much music for the theatre, as well as orchestral, chamber and instrumental music, but is most widely known for the delicately scored Marche des petits soldats de plomb (‘March of the little lead soldiers’) from his Album pour mes petits amis, published in 1887. With its Gallic refinement, it makes an interesting contrast with Jessel’s more Germanic and regimented toy soldiers. In the sunny south of Europe we meet Ernesto Becucci (1845–1905), who was born at Radicondoli in Tuscany and studied in Florence, where he also died. A successful teacher, his compositions were mostly in lighter style, among which several enjoyed considerable local success. It was above all the waltz Tesoro mio! (‘My treasure!’), dating from the 1890s, that gained him international acclaim, enjoying renewed popularity in Britain around 1950 when it was fitted with English words as ‘Waltzing the Hours Away’. A Latin touch is provided in this programme by José Padilla (1889–1960), an enormously gifted melodist who was born in Almería, Spain. During the 1920s he composed the songs Valencia and Ça, c’est Paris! for Mistinguett to sing at the Moulin Rouge in Paris, but acclaim in his native Spain and in South America had come with the lovely Princesita and La Violetera and the rousing El relicario (‘The locket’, 1918). This last was popularized by the Spanish singer Raquel Meller, but is most familiar internationally as an orchestral piece. Berceau de la musique classique, l’Europe a toujours produit un répertoire de pièces mélodiques qui ont pénétré en profondeur la conscience populaire mondiale. Certains de ces morceaux sont le fait de compositeurs davantage connus pour leurs œuvres à plus grande échelle, tandis que d’autres émanent de compositeurs de prétentions plus modestes, qui ne doivent parfois leur célébrité qu’à un seul succès mondial. Inévitablement, Vienne, qui fut si longtemps le centre musical de l’Europe, joue un rôle majeur dans toute sélection représentative. Car aucun recueil de musique populaire européenne ne saurait être complet sans une œuvre de la famille de compositeurs de musique de danse, Strauss. Aîné des trois fils du fondateur de la dynastie, Johann Ier, Johann Strauss II (1825–1899) dirigea son propre orchestre durant un quart de siècle avant de se retirer pour se consacrer à la composition d’opérettes. Sa Tritsch-Tratsch-Polka («Polka du bavardage»), qui date de 1858, est la toute première pièce du présent recueil. Elle tire son nom d’un hebdomadaire satirique viennois, et la ligne mélodique caquetante véhicule admirablement l’impression d’habitants du coin s’échangeant les tout derniers potins. Joseph Hellmesberger (1828–1893) appartenait à une autre famille viennoise célèbre. Son père Georg fut le violoniste autrichien le plus populaire de son temps, doublé du premier chef de l’Orchestre philharmonique de Vienne. Joseph emprunta une voie similaire, fondant le Quatuor Hellmesberger et assumant diverses positions éminentes. Son fils, Joseph junior, devint, à son tour, chef de l’Orchestre philharmonique de Vienne, et compositeur de ballets et d’opérettes. Les compositions de Joseph l’aîné furent surtout pour violon ou cordes, telles la Ball-Szene («Scène de bal»), qui repose sur une étude pour violon du violoniste Joseph Mayseder (1789–1863) et est écrite pour cordes, harpes (avec bois optionnels), timbales et triangle. Son thème principal tournoyant exige de la virtuosité de la part des violons et élabore une section centrale plus détendue. Ailleurs dans l’empire austro-hongrois, l’opéra populaire Švanda Dudák («Le Joueur de cornemuse», 1927), somptueusement instrumenté par le compositeur tchèque Jaromír Weinberger (1896–1967), obtint le plus large succès populaire de l’opéra tchèque, après La fiancée vendue de Smetana. Dans ces deux cas, le succès de l’œuvre fut prolongé par celui des danses populaires qui en furent extraites, telle, notamment, la Polka que Švanda joue sur sa cornemuse, lors de son entrée dans la deuxième scène de l’acte I.
Les trois compositeurs allemands représentés dans ce programme furent tous spécialisés en musique légère. «Oscar Fetrás» fut le nom de plume du chef d’orchestre hambourgeois Otto Faster (1854–1931). Il fut un admirateur si ardent du «roi de la valse», Johann Strauss, qu’il composa dans un style similaire, mais bâtit aussi une importante collection de souvenirs straussiens, allant jusqu’à modeler son apparence sur celle de son idole. Cette dette transparaît bien dans sa valse la plus célèbre, Mondnacht auf der Alster («Clair de lune sur l’Alster»), qui date d’environ 1890. Tout comme la plus fameuse valse de Strauss tient son nom du principal cours d’eau viennois, le Danube, l’œuvre de Fetrás doit son nom au cours d’eau hambourgeois—l’affluent de l’Elbe, qui forme deux lacs au niveau de Hambourg, l’Alster intérieur et l’Alster extérieur. Paul Lincke (1866–1946), l’un des meilleurs mélodistes d’Allemagne, composa quantité de pièces brèves à jamais associées à la ville de Berlin. Il joua et dirigea dans des orchestres de danse, des théâtres, et fut durant deux saisons le directeur musical des Folies-Bergère de Paris, avant de devenir chef d’orchestre de l’Apollo-Theater de Berlin. En 1899, il composa la première d’une série de courtes opérettes pour l’Apollo, moins concentré sur l’intégration dramatique que sur le spectacle et les pièces démonstratives. Ce fut pour l’une d’elles, Lysistrata (1902), une burlesque de l’histoire d’Aristophane, que Lincke produisit l’entêtante Glühwürmchen-Idyll («Idylle du ver luisant»). Pour la version de concert, il adjoignit à la chanson de l’opérette une section centrale contrastée, forme sous laquelle cette pièce devint un célèbre support pour la ballerine Anna Pavlova. Leon Jessel (1871–1942), né en Allemagne orientale, à Stettin (actuelle Szczecin polonaise), devint chef d’orchestre de théâtre, ainsi que compositeur d’opérettes et de courtes pièces orchestrales. Parmi ces dernières, deux atteignirent à une renommée internationale: Der Rose Hochzeitszug («Le cortège nuptial de la rose») et, surtout, sa Parade der Zinnsoldaten («Parade des soldats de plomb»), qui portraiture admirablement son sujet et fut, durant de nombreuses années après la Seconde Guerre mondiale, connue des enfants britanniques comme indicatif de la série «Toytown», diffusée dans le cadre de la «Children’s Hour» de la BBC Radio. Jonny Heykens (1884–1945), autre spécialiste de musique légère, naquit dans la ville hollandaise de Groningue. Élève violoniste d’Eugène Ysaÿe au Conservatoire de Bruxelles, il joua dans divers orchestres avant de fonder son propre orchestre à Groningue, en 1914. De toutes ses compositions de musique légère, ce fut surtout sa Ständchen («Sérénade») qui remporta un large succès international dans l’entre-deux-guerres. Nous tournant vers la Scandinavie, nous découvrons en Johan Halvorsen (1864–1935) un émérite violoniste, chef d’orchestre et compositeur norvégien. Sa production compta, outre trois symphonies, de nombreuses danses et rhapsodies norvégiennes, mais il est particulièrement connu pour sa Bojarenes Inntogsmarsj («L’entrée des boyards»), publiée en 1895. Les boyards étaient des membres de l’ancienne aristocratie russe, que Halvorsen découvrit après s’être vu offrir un poste en Roumanie. Il refusa ce poste, mais fut incité à composer cette pièce brillamment instrumentée, dans laquelle nous entendons les boyards s’approcher, puis défiler. Hugo Alfvén (1872–1960) fut un compositeur suédois, dont l’œuvre compta cinq symphonies, ainsi que de nombreuses pièces de musique vocale et instrumentale. Plusieurs de ses morceaux obtinrent un succès populaire international, parmi lesquels la première de ses trois Rhapsodies suédoises. Citons également la pièce enregistrée ici, qui fut originellement intitulée Roslagvår («Printemps à Roslag»), ou Roslagspolketta («Polka de Roslag»), et remporta un succès international, dans les années 1950, sous le titre plus accessible de Swedish Polka («Polka suédoise»). La riche tradition musicale française doit immanquablement figurer dans un programme tel que celui-ci. Charles Gounod (1818–1893) est considéré comme la figure centrale de la musique française du troisième quart du XIXe siècle. Bien qu’il soit surtout connu pour ses opéras, tel Faust, ses compositions regroupèrent des symphonies, des chants et des œuvres religieuses. Sa charmante Marche funèbre d’une marionnette, d’abord publiée comme une pièce pour piano (1872), connut une popularité telle qu’il en réalisa une version orchestrale six ans plus tard. Émile Waldteufel (1837–1915) doit son nom allemand à ses origines strasbourgeoises, mais il vécut pratiquement toujours à Paris, où il devint chef d’orchestre des bals du second Empire et de la troisième République. Il fut le compositeur de valses qui connut le plus de succès après Johann Strauss, et son chef-d’œuvre, Les Patineurs (1882), donne immédiatement à voir les patineurs en train de tester la glace, de glisser et de tenter quelques sauts audacieux. Des grelots de traîneau viennent rehausser la scène hivernale. Gabriel Pierné (1863–1937) naquit lui aussi dans l’Est de la France (à Metz) et déménagea à Paris alors qu’il était enfant. Élève de Massenet et de César Franck, il succéda à ce dernier comme organiste de l’église Sainte-Clotilde, à Paris. Il composa de nombreuses musiques pour le théâtre, de même que de la musique de chambre, de la musique orchestrale et instrumentale, mais est très largement connu pour sa Marche des petits soldats de plomb, délicatement instrumentée, extraite de son Album pour mes petits amis, publié en 1887. Son raffinement français offre un contraste intéressant avec les soldats de plomb, plus germaniques et stricts, de Jessel. Dans le sud ensoleillé de l’Europe, nous rencontrons Ernesto Becucci (1845–1905), qui naquit à Radicondoli, en Toscane, et étudia à Florence, où il mourut. Professeur réputé, il composa essentiellement des pièces de style léger, dont plusieurs jouirent d’un succès local considérable. Ce fut surtout la valse Tesoro mio! («Mon trésor!»), datant des années 1890, qui lui valut une renommée internationale; vers 1950, elle connut un regain de popularité en Grande-Bretagne sous le titre «Waltzing the Hours Away». Une touche latine est signée José Padilla (1889–1960), mélodiste immensément doué, qui naquit à Almería, en Espagne. Dans les années 1920, il composa les titres Valencia et Ça, c’est Paris!, que Mistinguett chanta au Moulin-Rouge; mais la célébrité dans son Espagne natale et en Amérique du Sud était déjà venue des charmantes Princesita et La Violetera, ainsi que de l’entraînant El relicario («Le pendentif», 1918)—qui fut popularisé par la chanteuse espagnole Raquel Meller, mais est davantage connu dans le monde entier sous sa forme orchestrale. Als Wiege der klassischen Musik hat der europäische Kontinent schon immer Melodien hervorgebracht, die sich tief im Bewußtsein von Menschen aller Herren Länder verankert haben. Einige Produktionen von Komponisten werden aufgrund ihres Gesamtumfangs geschätzt, andere stammen von Komponisten mit bescheideneren Ambitionen, für die ein einziger weltweiter Erfolg einen Hauch von Ruhm brachte. Wien, als langjähriges musikalisches Zentrum Europas, spielt in jeder Hinsicht eine unumstritten bedeutende Rolle. Keine Sammlung populärer europäischer Musik wäre ohne einen Beitrag der Komponistenfamilie Strauß vollständig. Der älteste Sohn von Johann des Ersten, des Gründers der Strauß-Dynastie, Johann Strauss der Jüngere (1825–1899), leitete für ein Vierteljahrhundert sein eigenes Orchester, bevor er sich zur Ruhe setzte und sich der Komposition von Operetten widmete. Seine Tritsch-Tratsch-Polka von 1858 ist das früheste Werk dieser Sammlung. Ihr Name stammt von einem wöchentlichen Wiener Satireblatt, und die schnatternde Melodienlinie vermittelt auf bewundernswerte Weise den Eindruck der lokalen Bevölkerung beim Austausch des neuesten Tratsches. Joseph Hellmesberger (1828–1893) gehörte einer weiteren gefeierten Wiener Familie an. Sein Vater Georg war einer der populärsten Geiger seiner Zeit in Österreich und der erste Leiter der Wiener Philharmoniker. Joseph ging einen ähnlichen Weg, gründete das Hellmesberger Quartett und besetzte einige bedeutende Positionen. Er wiederum hatte einen Sohn, Joseph junior, der Dirigent der Wiener Philharmoniker wurde sowie Ballette und Operetten komponierte. Der ältere Joseph komponierte hauptsächlich für Violine und andere Streichinstrumente, wie z.B. die Ball-Szene. Dieses Stück basiert auf einer Violinstudie des Geigers Joseph Mayseder (1789–1863) und ist für Streicher, Harfen (wahlweise mit Holzblasinstrumenten), Pauken und Triangeln geschrieben. Das wirbelnde Hauptthema verlangt den Geigern einiges an Virtuosität ab und umrahmt einen ruhigeren zentralen Abschnitt. Anderenorts in Österreich-Ungarn erntete die prächtige Volksoper Švanda Dudák („Schwanda, der Dudelsackpfeifer“, 1927) des tschechischen Komponisten Jaromír Weinberger (1896–1967) den größten Erfolg einer tschechischen Oper seit Smetanas Die verkaufte Braut. Wie schon bei Smetana läßt sich der enorme Erfolg auf die in der Oper vorkommenden Volkstänze zurückführen. Bei Weinbergers Oper ist dies besonders bei der Polka der Fall, die Schwanda zu Beginn der zweiten Szene des ersten Aktes auf seinem Dudelsack spielt. Die drei deutschen Komponisten dieses Programmes waren auf die Komponierung leichter Unterhaltungsmusik spezialisiert. „Oscar Fetrás“ war der Künstlername des Hamburger Dirigenten Otto Faster (1854–1931) , der ein so inbrünstiger Verehrer des „Walzerkönigs“ Johann Strauß war, daß er nicht nur in einem ähnlichen Stil komponierte, sondern auch alles sammelte, was mit Strauß zusammenhing und sogar sein Äußeres nach ihm ausrichtete. Seine Verpflichtung ihm gegenüber zeigt sich in seinem erfolgreichsten Walzer Mondnacht auf der Alster, der auf das Jahr 1890 zurückgeht. Ebenso wie Strauß gefeierter Walzer nach Wiens Hauptwasserstraße, der Donau, benannt ist, so nannte auch Fetrás seinen Walzer nach jener Hamburgs—nach dem Nebenfluß der Elbe, der in Hamburg zu zwei Seen, der Binnen- und Außenalster, wird. Paul Lincke (1866–1946) war einer Deutschlands größter Melodiker und Komponist vieler kleinerer Stücke, die unweigerlich mit der Stadt Berlin verbunden waren. Er spielte für und dirigierte Tanzorchester und Theater, und war zwei Spielzeiten lang musikalischer Leiter der Folies-Bergère in Paris, bevor er schließlich Dirigent am Berliner Apollo-Theater wurde. 1899 komponierte er die erste, sich weniger auf eine dramatische Integration als auf Spektakel und einzelne Stücke konzentrierende Reihe von kurzen Operetten für das Apollo. Für eine dieser Operetten, Lysistrata (1902), eine Burleske aus der Erzählung von Aristophanes, produzierte Lincke das fesselnde Glühwürmchen-Idyll. Für Konzertaufführungen fügte er dem Operettenlied einen gegensätzlichen Mittelabschnitt hinzu, und in jener Form wurde das Stück das perfekte Medium für die Ballerina Anna Pawlowa. Leon Jessel (1871–1942) wurde im ostdeutschen Stettin geboren (dem heute polnischen Szczecin) und wurde Kapellmeister sowie Komponist von Operetten und kurzen Orchesterstücken. Zu letzteren gehören zwei, die international bekannt wurden—Der Rose Hochzeitszug und vor allem seine Parade der Zinnsoldaten. Diese porträtiert ihr Subjekt auf bewundernswerte Weise und war noch viele Jahre nach dem Zweiten Weltkrieg vielen britischen Kindern als Titelmusik der „Toytown“-Serie des BBC-Radio-Kinderprogramms bekannt. Der im niederländischen Groningen geborene Jonny Heykens (1884–1945) war ein weiterer Meister der Unterhaltungsmusik. Am Brüsseler Konservatorium nahm er Violinunterricht bei Eugène Ysaÿe, und spielte in verschiedenen Orchestern, bevor er 1914 in Groningen sein eigenes Orchester gründete. Von all seinen Kompositionen der Unterhaltungsmusik war vor allem sein Ständchen dasjenige, das zwischen den Kriegen internationalen Erfolg genoß. In Skandinavien finden wir in Johan Halvorsen (1864–1935) einen ausgezeichneten norwegischen Geiger, Dirigenten und Komponisten. Zu seinen Werken zählen drei Symphonien sowie zahlreiche norwegische Tänze und Rhapsodien. Am besten bekannt ist er allerdings für sein Bojarenes inntogsmarsj („Das Eindringen der Bojaren“), das 1895 veröffentlicht wurde. Die Bojaren waren Angehörige des alten russischen Adels, über den Halvorsen las, als ihm eine Stelle in Rumänien angeboten wurde. Er lehnte das Angebot zwar ab, war aber angeregt worden, dieses brillant geschriebene Stück zu komponieren, in welchem wir die Bojaren zunächst herankommen und dann vorbeiziehen hören. Hugo Alfvén (1872–1960) war ein schwedischer Komponist, der fünf Symphonien und eine große Menge Vokal- und Instrumentalmusik hervorbrachte. Er komponierte einige Stücke, die internationalen Erfolg erlangten, darunter die erste seiner drei Schwedischen Rhapsodien. Ein weiteres war das hier aufgenommene Stück mit dem Titel Roslagvår („Frühling in Roslagvar“) bzw. Roslagspolketta („Roslag Polka“), die während der fünfziger Jahre unter dem zugänglicheren Titel Schwedische Polka international Beachtung erhielten. Frankreichs reiche musikalische Tradition darf in einer Sammlung wie dieser nicht fehlen. Charles Gounod (1818–1893) wird als zentrale Figur der französischen Musik des dritten Viertels im neunzehnten Jahrhundert angesehen wird. Zu seinen Kompositionen zählen Symphonien, Lieder und religiöse Werke, am besten bekannt ist er allerdings für seine Opern wie Faust. Der reizende Marche funèbre d’une marionnette („Trauer­marsch einer Marionette“) wurde zunächst 1872 als Klavierstück veröffentlicht und der Erfolg war so enorm, daß Gounod sechs Jahre später eine Orchesterversion schuf. Émile Waldteufel (1837–1915) verdankt seinen deutschen Nachnamen seiner Straßburger Vorfahren. Er selbst verbrachte allerdings praktisch sein gesamtes Leben in Paris, wo er Dirigent der Bälle des Zweiten Reiches und der Dritten Republik wurde. Er war nach Johann Strauss der erfolgreichste Walzerkomponist, wobei Les Patineurs („Die Schlittschuhläufer“) sein Meisterwerk war. Bei diesem Werk hat man gleich die Eisläufer vor Augen, wie sie umhergleiten und gewagte Sprünge versuchen. Schlittenglocken unterstreichen die winterliche Szene. Gabriel Pierné (1863–1937) wurde ebenfalls im Osten Frankreichs geboren (in Metz) und zog noch als Kind nach Paris. Er war Schüler von Massenet und César Franck, und trat später die Nachfolge des letzteren an der Kirche von Ste.-Clotilde in Paris an. Er komponierte viel Musik fürs Theater, wie auch Orchester-, Kammer- und Instrumentalmusik. Am bekanntesten wurde er allerdings durch die ausgefeilte Komposition des Marche des petits soldats de plomb („Marsch der kleinen Zinnsoldaten“) aus dem 1887 veröffentlichten Album pour mes petits amis. Durch seine gallische Feinheit bildet er einen interessanten Kontrast zu Jessels eher germanischen und reglementierteren Zinnsoldaten. Im sonnigen Süden Europas treffen wir Ernesto Becucci (1845–1905), der im toskanischen Radicondoli geboren wurde und in Florenz studierte, wo er auch starb. Er war ein erfolgreicher Lehrer, und seine Kompositionen hatten einen insgesamt leichteren Stil. Darunter waren auch einige lokale Erfolge. Internationalen Ruhm brachte ihm vor allem der Walzer Tesoro mio! („Mein Schatz!“) aus den neunziger Jahren des vergangenen Jahrhunderts, der in Großbritannien um 1950 erneute Popularität genoß, als man ihn mit englischen Worten als „Waltzing the Hours Away“ unterlegte. Einen Hauch mediterraner Melodien bringt José Padilla (1889–1960), ein enorm begabter Melodiker aus dem spanischen Almería. Während der zwanziger Jahre komponierte er Lieder wie Valencia und Ça, c’est Paris! für Mistinguetts Auftritte im Moulin Rouge in Paris. In seiner Heimat Spanien und in Südamerika kam der Erfolg mit den lieblichen Liedern Princesita und La Violetera, sowie dem mitreißenden El relicario („Das Medallion“, 1918). Das letztere Stück machte der spanische Sänger Raquel Meller populär, international viel bekannter ist es aber als Orchesterstück.